Our range of products include spacer tapes for glazing cladding. Spacer Tapes for Glazing Cladding Double-sided self-adhesive foam with high density. Exclusive use of high-grade pure acrylic adhesives ensures excellent shear resistance on surfaces of glass, steel, and anodized aluminum. 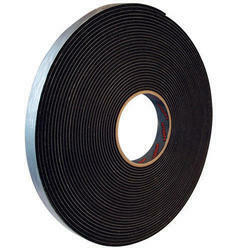 This tape excels by its paramount weathering resistance and by its outstanding resistance against ultra-violet radiation. spacers have an open cell structure. This allows air and moisture to reach the silicone to allow optimum curing. It is used as a spacer during window fabrication and facade construction. The product is a spacer material, but not a structural component. It provides an initial fixation of the glass panel. It maintains the required distance (mostly 6.4 mm) in order to obtain the exact specified silicone thickness. It stabilizes the components while the sealing silicone cures. Its advantage over an extruded profile is that it eliminates the need of using clips and thus avoids two labour and cost intensive steps.